HomeAnimeSaint Seiya Omega	No ratings yet. Saint Seiya Omega (聖闘士星矢Ω) is an anime TV series produced by Toei Animation. 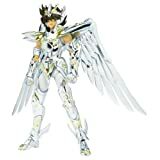 It acts as a spin-off of the Saint Seiya anime series written and illustrated by Masami Kurumada, produced in commemoration of the 25th anniversary of the franchise.